All of full time designer/freelance designers deal with clients day in and day out. Here’s a series of creatives that defines the two types of clients we come across on a regular basis. There are two types of design clients in the world, Ones who listen to you (those who really want your expertise in more than just code/design) and the ones who don’t. The only thing worse than that is hearing a client say “I’ll know it when I see it”. Actually they means “many changes ahead”. Which is always a red flag, and usually means the exact opposite of that statement. Some ‘designers’ are happy to simply act as a tool for their clients but I don’t think they end up providing anything more than button pushing. Creative thinking is one of (if not the main) reason a client should engage with a designer, Some of Client says “It will takes just 2 minutes to create.” Previously we have also posted and article SAY NO TO FREE DESIGN. Some of design client want to excuse, bargaining or refuse to pay after completion of project this is most unfortunate truth. See also : Freelancer VS Full-Time Designer – Which is Better? 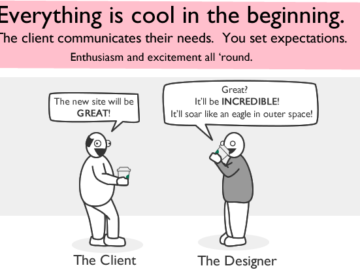 Hilarious Comic Strips – How Clients Ruin Web Design Project.